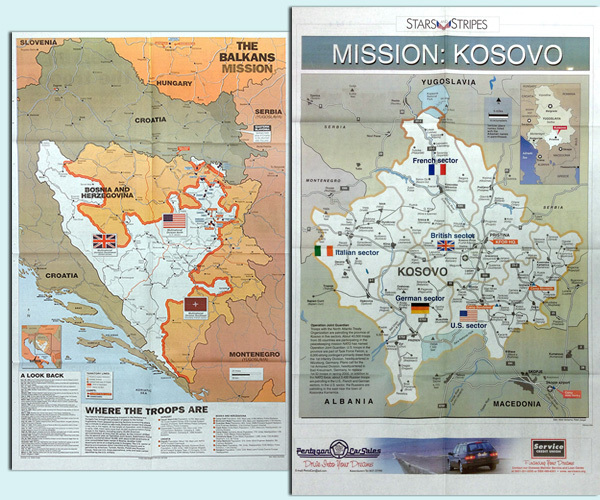 Vintage maps show U.S. and NATO peacekeeping presence in the Balkans and Kosovo. Set of two vintage Stars and Stripes maps shows deployment of U.S. and NATO forces during peacekeeping missions in the former Yugoslavia as the 21th century was drawing to an end. 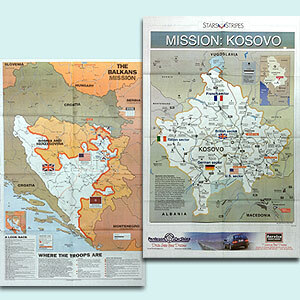 The Kosovo map, printed in 2000, shows the zones patrolled by NATO troops during the Operation Joint Guardian peace mission. 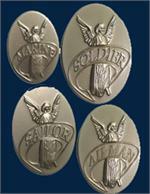 The back lists U.S. troop commands in Kosovo and includes photos. The Balkans map, printed in 1997, features NATO operations in this area of Eastern Europe. The back details Stars and Stripes in Europe, the Pacific and its eventual consolidation of operations in a new Washington D.C., headquarters. Both vintage publications feature full-color maps on one side; the details on the back are printed in black only. Maps come folded and measure 22.5 x 35.5 inches when flat. See "View More Images" to see the back of the maps.